We visited the chapel on our visit to ground zero and the National September 11 Memorial Museum last year. The rear of the chapel faced opposite the east side of the World Trade Centre, as it does now to the Freedom Tower. After the attack on September 11 it served as a place of rest and refuge for recovery workers at the World Trade Center site. 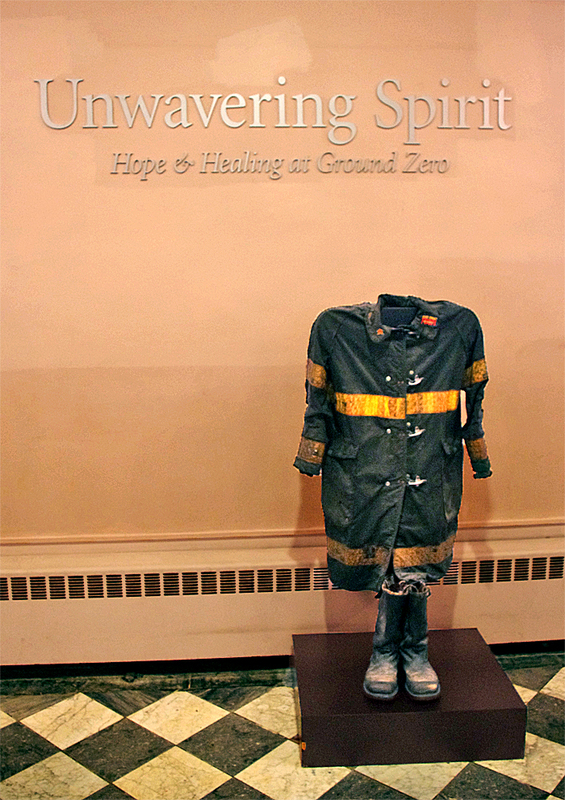 As we pause to remember and reflect on that fateful morning fifteen years ago today this uniform together with the crushed remains of Ladder 3 that are so reverently displayed in the Museum, and about which I posted earlier this year, all serve to remind us of the sacrifice and bravery of those 343 firefighters of the New York City Fire Department who were lost that day, together with an additional 68 emergency workers and the 2566 innocent lives they were trying to save. Wonderful tribute. We will never forget. Many thanks Mirian. Indeed we will not.